Back in 2012 as I’ve launched startupolic.com, I remember that almost nobody was blogging on the Swiss startup scene. Or most were abandoning the effort after a few posts. Fortunately, this has changed! 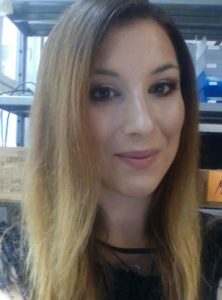 Today I’m pleased to publish a guest post by Tatjana de Kerros-Budkov, who is currently the Startup Builder at Ricolab Innovation Lab (Ricola), Mentor, and 2x entrepreneur- with one exit under her belt- and has helped startups raise over $10M in the last 12 months. Previously, she was an entrepreneurship & innovation Advisor to the Saudi government, collaborated with 500 Startups KSA and roamed the Arabian desert building entrepreneurship & VC tech ecosystems. Now living in Zurich- she’s passionate about showcasing Swiss tech startups- bridging ties with international VCs. This post was initially published here. Altogether, they’ve raised over $1.4 billion since 2015. They’re growing at an average rate of 21% and employ over 1,900 people. These are Switzerland’s best funded startups. From Geneva, through to Zurich, I’ve mapped out the 50 of the best funded tech startups across major Swiss cities since 2015. The analysis shows not only which cities have transformed into startup tech hubs and attract the largest VC tickets, but also demonstrates the continued disparities between German and French speaking Switzerland in terms of funding and deal size. In the midst of a ‘digital revolution’- insights into Switzerland’s most funded startups shows which sectors attract the largest investments, but also which technologies are starting to gain momentum and investor interest. Finally, as the map covers startups that have had their last funding round in the last 24 months- I have analyzed which rounds are most prevalent across regions, and their average value- giving a glimpse towards the direction in which VC, PE and CV is moving in our small innovation nation. The investment volume among Switzerland’s 50 best funded startups ranges from $233M on the high-end of the funding spectrum for pharmaceuticals startup Novimmune to $2.4M for another pharmaceutical outlier, Memo Therapeutics. 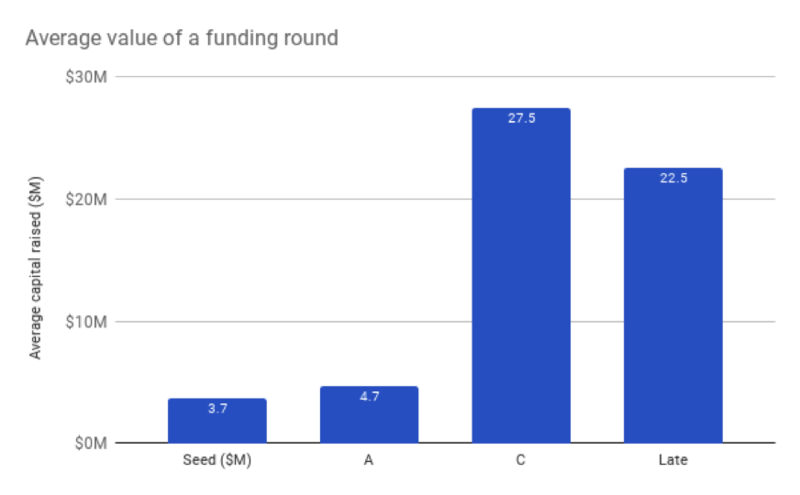 The average amount of funding received among all the mapped-out startups is $28M, with the most prevalent round being series A– making up 38% of all rounds (or 19 rounds in total). 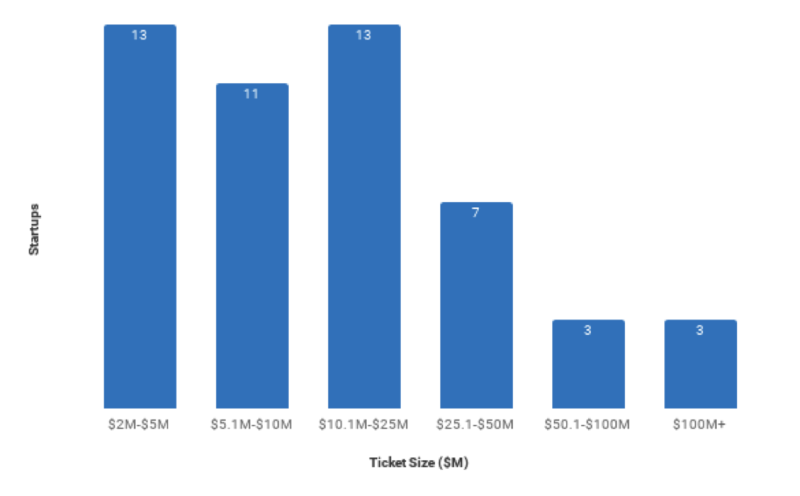 The most prevalent ticket-sizes range from $2M-$5M, and $10.1M- $25M among these startups across Switzerland. What does this tell us? Firstly, it is important to note that this data will not, by default, include very early-stage seed investments. What the data does conclude however,is that if a Swiss startup that raises $2.5M makes it on the map- the Swiss ticket size of a round is generally quite low in comparison to other countries. Moreover, there are only 6 startups since 2015 that have raised more than $50M- showing a clear dearth in late-stage funding, and putting in question the exit vehicles for investors across the investment lifecycle. So what is the average value of each round in Switzerland? The average seed round raised by a Swiss startup is valued at $3.7M, rising by a mere million to $4.7M for a Series A. This jumps to $27.5M for a Series C, and then drops by a considerable $5M for late-stage capital- averaging $22.5M. Did you notice a gap in the data? Indeed- Series B are non-existent. Funding rounds just jump from A to C. Either Swiss startups are wizards at increasing their valuation overnight, or, which seems most likely- there is a gap in the market for follow-on funding- (which I’m personally placing my bets on). From my knowledge of the Swiss VC ecosystem, the latter option seems to fit right in with current funding patterns. Investors tend to cluster in either the pre-seed and seed rounds, or later-stage funding- which at this stage becomes increasingly concentrated with corporate venturing funds. Given the current relatively low volume of deal-flow in Switzerland, investors compete on each extreme of the funding spectrum. In the middle, not so much- and investments are riskier. However, this can also translate into a low survival rate for early-stage startups, making the trend of multiple rounds of early-stage capital obsolete and unnecessary in the current market. Either the startups perform sufficiently well to attract much larger players (and be acquired), or they die. Which industries are Switzerland’s tech outliers disrupting? Of course it comes as no surprise. Among Switzerland’s 50 best-funded startups, 17 are pharmaceuticals and biotech companies (equivalent to 34%). This translates both in terms of the number of investments, as well as the overall dollar-volume- which stands just short of $1 billion ($989.2M to be precise). But there are some surprises. Agtech startups have definitely been catching investors interest- accounting for 4 startups in our map (the second most popular sector after pharmaceuticals). This includes startups such as EPFL spin-out Gamaya ($3.2M raised) and Zurich-based aquaponics startup Urban Farmer ($5.3M raised). Although agtech startups included in this map have only raised together a total of $16.5M- I have no doubt this is set to increase. 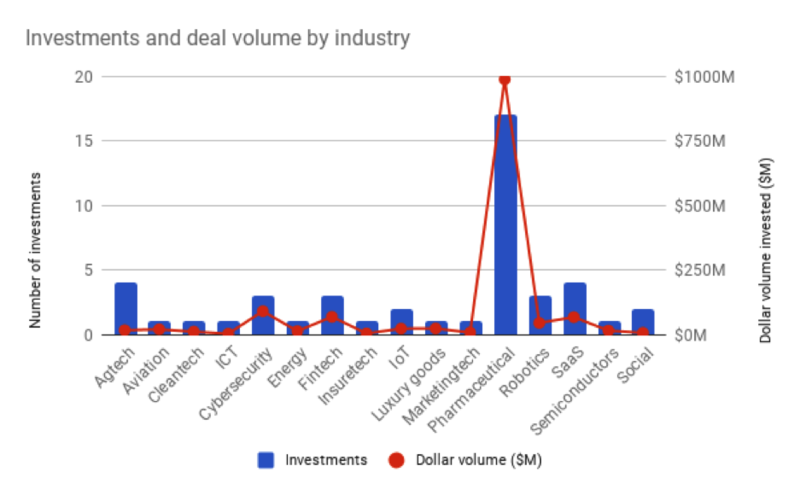 Whilst only 3 cyber-security startups make our map-together – they raised over $90.3M, putting them in second place in terms of dollar volume behind pharmaceuticals startups. In light of Switzerland’s thriving banking and financial industry, it comes as no surprise that 3 fintech startups make it into the map- raising $68.4M between them – of which $50M (disclosed) was raised by late-stage startup Centralway from the Investment Corporation of Dubai. Fintech is followed closely behind by SaaS startups- who make up $68.4M of investments. Insurtech, represented by Stonestep, a ‘microinsurance-as-a-service’ startup raised $4M – the only insurtech startup on this map- but a sign that investors may soon want to start betting big in this segment. A similar heat warning can be linked to Scandit – the only marketingtech startup who makes this list- but raised $7.5M. So which city wins the war for Switzerland’s best startups? As small as Switzerland is- it is a country divided by language and culture- and as art imitates life, each region vies to attract the best startups, and become the country’s leading tech hub. It must be Zurich right? By the number of Zurich-based startups included in our map, yes, Zurich wins, accounting for 17 out of 50 startups – or 34% of Switzerland’s top 50 best-funded startups. Molecular Partners makes it top of the list, having raised a $16.6M Series C with a total investment of $76.6M- followed by Sequana Medical (another Series C pharmaceutical startup that raised $60.4M in total), and of course, fintech outlier Centralway. Zurich is clearly strengthening it’s grip as the tech capital of Switzerland, and attracting a new breed of startups from IoT through to cleantech. But Lausanne wins as the city to raise the largest amount of capital. The Olympic city (in which I grew up in) and home to the world-reknowned EPFL campus comes out top in our map- with 13 startups raising $451.8M between them. In comparison, whilst Zurich startups are better represented, the city’s startups raised only $312.4M in comparison. Geneva comes third- both in terms of startups represented, as well as investment volume ($288M) – followed by Basel, who saw 5 startups make the rank with a total of $67.2M invested. Which leads us to question- in which city are you most likely to raise the highest round? 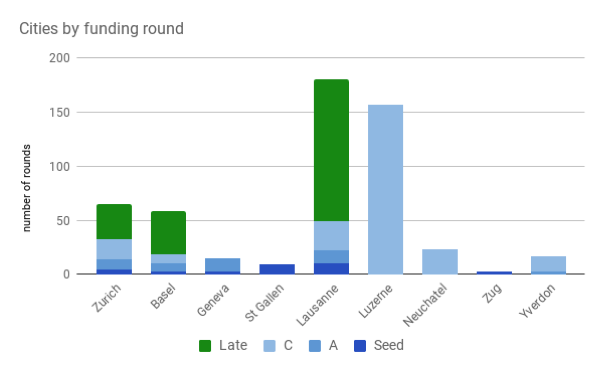 If you’re raising a seed round, you should head to Lausanne, who tops our map with the most seed capital at an average of $10.2M raised, closely followed by St Gallen with $9M. Series A continues to be firmly dominated by the French-speaking side of Switzerland, with the highest average value of a round to be found again in Lausanne ($11.8M) followed closely by Geneva ($11.3M). Zurich ranks third with an average Series A round raising valued at $9.2M. For a Series C, discrepancies between the French and Swiss-Germans remain, with Lausanne topping the map once again at $27.4M, followed by Neuchatel with $23.2M, and then Zurich at $17.8M. It is worthwhile to note however, that Luzerne-based Series C startup CeQur raised a $156.6 mega-round, that would slightly skew the data if included. And who wins the highest late-stage funding average? 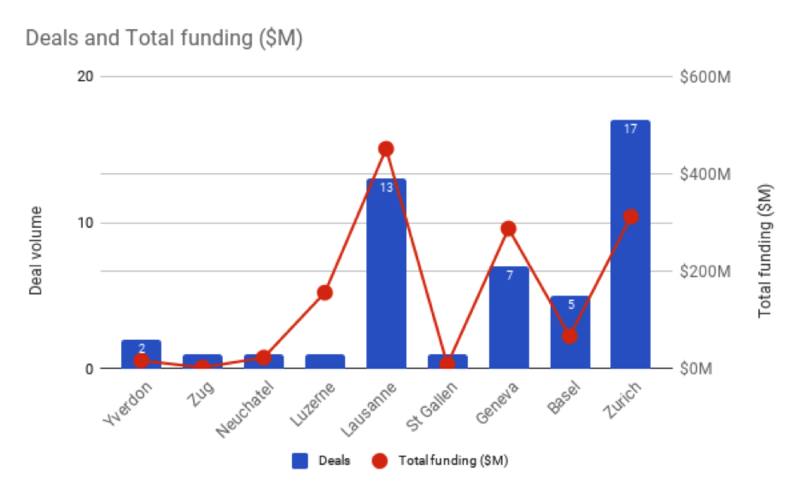 Lausanne once again, at $130.5M – followed unsurprisingly by Basel – the global pharmaceuticals hub who saw its best funded late-stage startups raise an average of $39.8M – followed closely by Zurich at $32.6M. These were the only three cities nationally which have seen any late-stage investments since 2015. What does this map tell us about the future of startup funding in Switzerland? Unfortunately, and as I previously noted – it highlights continued discrepancies between regions – both in terms of the quality of startups created (in investors eyes) – as well as investor risk-aversion and access to capital. Most startups flock to Switzerland’s most reputed tech hubs in Lausanne and Zurich, or continue to concentrate in areas dominated by the pharmaceuticals industry (Basel). Whilst this shows that local ecosystems are strong, it also highlights that the spillover effect of access to risk capital and innovation will remain regionally constrained- at the detriment of the economic growth and diversification of other cities across Switzerland. As I also previously highlighted, investors cluster in either seed and very early-stage rounds, or late-stage funding. There is a ‘missing middle’ for risk capital in the VC and corporate venturing industry. Which leads us to question if this may not be the cause for a number of startup deaths in Switzerland, and their failure to scale. Finally, it is notable to underline that many of the late-stage startups included in this map raised a down-round in their subsequent funding rounds. Whilst I didn’t include this in the data (and this is definitely worth further investigation), this could by symbiotic with a nascent, and risk-adverse investor sentiment- but also the financial performance of startups (for example their difficulties to expand outside the immediate Swiss market), and an exit-market that focuses on acquisitions rather than inflated valuations. To round-up, if you’re in pharmaceuticals, cybersecurity, fintech and digital services – startups will increasingly find investor appetite to raise capital – and contribute to Switzerland’s transformation into a digital economy. Oh, and for you who are interested – here is the full table of the 50 best-funded startups in our alpine nation. You can also find the complete list of the 50 startups hereafter. The post The 50 Best-Funded Startups in Switzerland in One Map (and What It Means For The Startup Ecosystem) appeared first on Startupolic. Writing a business plan at the time of the lean startup sounds like a weird idea. No? Many people think that writing a business plan is no more needed. Which is true and… wrong, at the same time! are dreaming your project instead of starting it (yeah, there are many wannabe entrepreneurs around there)! Among other ones, these are reasons not to write a business plan. Of course, when you’re starting a project, you should have a rough idea about the potential market. But you should start by focusing on the pains faced by your target customers. And trying to figure out how to solve them. A business plan is time intensive: starting from scratch, it takes at least 50 hours to write it. If you have already done it and know what to include in it. Of course, if you need to proceed to an extended market research, it’s not enough. Time is the most valuable asset entrepreneurs have and therefore, you need to carefully think about why you should (or not) write your business plan now. If it is to raise money… yes, it’s a valid reason. But again, think about the cost of opportunity (how much you could achieve during this time – how many prospects you could call or meet?). To invest this time, you should have a decent probability of getting this money! The most frustrating in writing a business plan is that the moment you click “save to PDF”, the document is already outdated. Why? Because if (and only if) you have already started, things are moving fast. 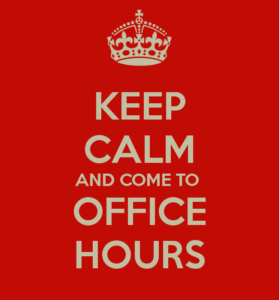 You may have more offers to do, received great news about a potential partners, an employee could have resigned, etc. In my experience reading many business plans over the past 10 years (a bit less this pas year), the biggest learning you get is to understand how the founder / the company thinks and sees the opportunity. How the founder writes and the completeness of the business plan tell you probably more than the actual words contained in the document. You can also understand quickly if the founder understands all business skills required to start a business. Forget about the solidity of the financial projections. Institutional investors (Venture Capital) want to see a business which has the potential to be make CHF 50M turnover or to be sold for CHF 100M. Which makes your financial projections quite a bit hard to believe. Almost all business plans that I’ve seen reach sales of CHF 40-50M at year t+5, which is OK if you’re a startup that should be able to scale (as every startup – if a new business has not the potential to scale, people should stop to name it “a startup”). The reality is somehow different, however ;-)! A common “rule” among investors is to divide the sales projections by 2 (or 3) and postpone them from one year. If you’re not bankrupt or stopping the project in the mean time, you’ll see that’s often not wrong. Unfortunately! Doing financial projections is a great exercice for the founder, however. It makes you think about scalability and the key elements of your potential exponential growth. It also shows quickly if you have an idea of the business or not (I remember reading a business plan projecting a CHF 100M turnover at 2nd (!) year after starting up – immediately discredited and I’ve probably not spent more time reading it!). Many entrepreneurs hate this financial projections exercice. As you do not really know. A 12 months budget is always more accurate (at least on the costs side!). So, why should you write one? A business plan serves to think about strategy and show your roadmap. To investors, but also to all potential stakeholders (employees, partners, etc.). I’ve discovered an interesting Visme infographic from startup mentor Jon Westenberg, where he emphasized the importance of writing a business plan even if you’re just a startup. He gave helpful tips on how you and your team can write it. The post Should You Write a Business Plan? appeared first on Startupolic. Each year beginning of May, more than 500 CEOs, Ministers and investors from the tourism industry meet in Luzern for the World Tourism Forum. The Forum aims in gathering global leaders of the travel, tourism and hospitality industries to learn about the new development and brainstorm on how to adapt to the changes happening. And to meet startups ! This year, World Tourism Forum is organizing a Startup Innovation Camp (coaching day with presentation to the jury) the day before the forum. Among 170+ applications coming from all over the world (more than 50 countries), 16 finalists were selected, segmented in 4 categories : Impact, Transaction, Destination and Hospitality. The finalists come from Europe (Cyprus, France, Germany, the Netherlands, Poland, Spain, the UK), Asia (India, Sri Lanka) and the USA. They were selected by a jury leaded by well-known Swiss entrepreneur and investor Roland Zeller (founder of Travel.ch), comprising Sam Friend (experienced executive, investor and entrepreneur, ex-Wotif.com and TravelCandy.com), Amel Karboul (former Minister of Tourism in Tunisia), Axel Schulze (serial entrepreneur and leading a startup accelerator) and René Zeier (co-head of Smart-Up programme at University of Applied Sciences and Arts Lucerne). I’ll be attending the World Tourism Forum (as you probably know by now, I have a strong interest in travel and tourism with Planify!) this year, so do not hesitate if you’d like to grab a coffee! Bidroom (category « Transaction») is a revolutionary private hotel-booking platform that generates direct reservations without charging any commission and provides the best rates for guests. CityStasher (category « Destination ») is a digital platform for left luggage, connecting travelers with local businesses who store their bags for 60% less than station facilities. Daytrip (category « Transaction») is a platform for traveling with local drivers who drive them from one city to another, exploring sights along the way that would otherwise be difficult to reach using traditional public transportation. Green City Solutions (category « Impact») addresses the global problem of air pollution by combining a special, vertical installed moss culture with internet-of-things technology. Hospitality Leaders (category « Hospitality») is a hospitality industry community portal aggregating a global candidate pool enabling digital talent management and recruitment for the hospitality industry worldwide. Hypermedia Interactive Services (category « Impact») is a Startup that has developed a bespoke learning and performance ecosystem solution in sustainable practices for the hospitality industry. Global Himalayan Expedition (category « Impact») is focused towards providing clean energy, digital education and wireless connectivity access to remote Himalayan communities through impact tourism. Orbirental (category « Hospitality») is a SaaS Technology platform that enables vacation rental management companies to streamline and scale their business through automation and integration. Swiss Institute (category « Impact») is a game changer in developing tourism and skills in Sri Lanka and South Asia. Paris Helpline (category « Destination ») service is the first tourism travelers caring service aimed at any major destination of the world. Servantrip (category « Hospitality») is the first e-Commerce Global platform that allows local “drivers, travel guides, interpreters, and legal advice” to access easily to international clients. Tastemakers Africa (category « Destination ») is an online marketplace where you can list, discover, and book epic experiences in African cities. TimeLooper (category « Destination ») is a global augmented virtual reality production and content distribution company that specializes in the development and delivery of immersive experiences. WeTravel (category « Transaction») is the payment platform for multi-day group tours. Thousands of travel companies, yoga retreat leaders and student trip organizers use WeTravel to collect funds and manage group trips. The post 16 tourism startups to discover at World Tourism Forum 17 appeared first on Startupolic. It’s a secret for nobody that money is scarce when you’re launching your startup. Even if the Swiss Venture Capital Report shows an interesting growth in startup funding over the 3 last years, with almost a doubling of the funds invested in Swiss startups. About CHF 900M were invested in 2016. Which can be seen as a great sign for entrepreneurs, but which is in the same time…ridiculous. At least if we speak about digital startups (fintech included), which represent about 30% of this amount. This total includes massive funding rounds (80-100M) in the life sciences industry, which is a bit hiding the rest. But it’s ridiculous if we compare to London startups (mostly digital), which raised… EUR 1.32 billion in the first 6 months of 2016! I was discussing with another startup founder the other day and he told me that his feelings and observations about the current startup hype (it’s cooler than ever to do a startup – like it or… not! ): everybody seems to be looking for funding and if you cannot raise money, you’re failing. Of course, it’s all but not true. Fundraising is a mean for a goal. Not a goal in itself! And there is still this misconception about writing a 20 pages business plan to show that you actually have a plan. But this business plan is outdated as soon as you freeze it into a PDF (if not, that means you haven’t started executing!). If you spend one week (that’s more or less what it takes) to write a business plan, it should be for something. Something that should generate a real Return On Investment. Have you ever thought about how many potential customers you can meet or even simply contact during a full week? One week probably allows you to have 20-30 meetings. And reach out to about a hundred potential customers. What is your choice? The first one requires generally a lot of money even early on. The second one can make progress with less money, but has to go ways faster to take over a market. If you’re in the second category, you’d rather invest your time in customers to get traction (and raise funding after, to fuel the growth). Otherwise, you’re just wasting your time with nice guys who will never invest. You need to have a clear understanding of the type of startup you are managing. Have you thought about startup awards to fund your startup? Yes, it can be a viable solution, at least for some time. In Switzerland, we have seen the health tech company Abionic over-succeeding in this strategy some years ago. A great innovation with a lot of IP, a CEO able to deliver a great pitch and explaining simply what problems they were going to solve. That’s how they were able to get a lot of grants to survive to the early days post-university (remark: I do not know the details of their strategy and this time, I was (and still am) just an external observer). They were simply impressive. Startups fighting at the same startups awards had less chance to win, just because the “opponent” was too good. Have you ever thought about awards to fundraise your startup, or at least to help you move forward? If you’ve decided to follow this strategy, you need to realize that it’s not that easy, too. It’s the jungle out there and everybody is fighting to survive (and ultimately grow). Participating to startup awards takes also some time, as you need to have a great story to pitch (and to TRAIN*TRAIN*TRAIN) as well as the documentation (remember the Business Plan above…) ready. The good side of awards are that you can gain free press coverage, some credibility and fall under investors (and sometimes customers) radar. If you win (or at least are in the nominees), of course. What happens if you never win? It can also alter your image: if your startup is participating to every possible award and judges keep seing your application (and maybe with not that much progress over the months), they may flag you as a loser. And you’re just wasting time in applying everywhere. There’s a good thing about the “startup hype”: there are more and more cash prizes available in awards. So if you spend a bit of time browsing the web, you’ll probably find an award corresponding to your startup! If you read me for a while, you may know that I was in charge of launching the first fintech accelerator of Switzerland, Fintech FUSION. I remember quite well the rise of Fintech in Switzerland (read: The Waking Up of FinTech in Switzerland) and the trendiness of the topic, back in 2015. Fintech and then blockchain were hype at this time. Then, the term Insurtech popped out and that was the new trendy topic, coupled with the apparition of chatbots based on messenging platforms. Now I’ve seen that new terms are popping up, like Proptech (property-tech). I remember also quite well categorising the various Fintech sub-segments (we limited to… 15!). That’s a good thing for startups to find a suitable accelerator or award. And they have very interesting initiatives to foster everything digital and financial. KPMG and LHoFT (Luxembourg House of Financial Technology) have joined force for the second edition of the “Fintech Awards Luxembourg“. 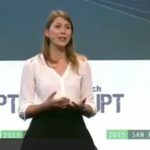 There is EUR 50’000.- for the winner, as well as some other cool prizes (like a one-week immersion into Silicon Valley) and the opportunity to pitch in front of potential high-qualified customers. 15 startups will be selected and invited to present on June 28th. Application deadline is really soon: 1st of May 2017 (so you’d better not wait to apply, even more than it takes literally 5 minutes to apply). The post Get The Money! appeared first on Startupolic. January 2012. January 2017. Startupolic.com just turned 5 years old. It’s incredible how fast time is running out ! It’s time for celebration! In one of my previous life, I used to be a startup coach and business developer for a technology park, lost in Northwestern Switzerland (in canton of Jura). My mission was to discover promising startups and try to attract them there, with a local economic development mission: bring and create high qualified jobs there. I was travelling across Switzerland, attending almost every startup event I could (years ago, it was still manageable ! ), trying to bring as much value as I could. With the underlying goal of convincing entrepreneurs to relocate to Jura (which was not a sinecure, I have to admit – but it worked out to some extend). I was meeting many people of the Swiss startup ecosystem, from professional investors to first-time entrepreneurs, from startup coaches to foundations. I had the chance to meet many entrepreneurs who eventually became friends: Arnaud Bertrand (Housetrip), Tej Tadi (founder of the Swiss unicorn MindMaze), Adrian Locher (DeinDeal), Pascal Mathis (GetYourGuide), Marc Bernegger (Amiando, etc.) – to mention only the most famous (sorry for all the other ones !). I was meeting first-time and serial entrepreneurs on an almost daily basis. Most of the time, I was learning more from founders than I was « teaching » them. This just always impressed me. Man, I was learning so much. And, sometimes, I realized that obvious things (for me) I was telling were… finally not that obvious at all. I realized that I, Sébastien, was not scalable. Not that I did not want to meet people anymore. If you’ve already met me, you know that I truly believe in real-life interactions. How could I reach more people? At that time, I was an avid reader of AVC and BothSidesOfTheTable (well, I’m still a huge fan of Fred Wilson and Mark Suster – but now I allow me NOT TO read every post they share !). For about a year, I had this crazy idea in my head to start blogging about startups in Switzerland. Why about startups? Because it’s one of my passion. And passion is everything in life, right? Early January 2012, I decided that it was time to start. Finally. I needed a name (the easiest way would have been to name it « Sebastien Flury’s blog » – but well, I thought I could do better than that…). I’m someone who loves to play on words and thought: find something that express everything (and yeah, tell who I am) while be funny. Startup and workaholic? You name it. Startupolic was born! As you know, Switzerland is a multi-languages country, with German, French and Italian. In which language should I blog (hum, unfortunately, I can’t speak Italian)? English was for me an evidence. Even though I knew that I would probably not reach as many people as if I’d be writing in German or French. But English is the language of business and the one to make Swiss startup scene visible to the rest of the world. Because there are many things happening in this amazing country and Switzerland is not often under the radar! So, my defined target audience was (and still is) a « niche audience squared » (startups times English)… Anyway, I thought the idea of blogging about startups in Switzerland was still cool! I bought my domain name on January 9th and decided I wanted to publish the same week. I asked a friend (thank you Raphael!) to design me a little logo and to choose some colors related to my topic, startups. I was not aware of how to build a blog at this time, and I did my MVP (Minimum Viable Product) with tumblr. Which was too limited if you were using the basic version and pre-built templates, but ways enough to start. If nobody would ever read what I had to say, at least, I would have started quickly. I had a name. I had a logo. I had a platform. I also had kind of an audience (my twitter followers – which was growing up slowly as I have never been a fan of « following back »). All I still needed to do was… to start publishing! Of course, I had already written down dozen blog post ideas. For anyone who want to start blogging: don’t just write down titles, write at least half a dozen complete articles in advance! I published my first ever blog post on January 12th, 2012. Presenting myself (My First Steps on Swiss Startup Scene). Simply. I was checking my Google Analytics very often, to see if I had someone reading… not many, but there were some people on it! First check! And at this time, startupticker was not widely spread to leverage it to attract some visitors interested by startups. I then had a very intense publishing schedule, with about 2 blog posts a week. It started to grow, slowly. Even if decided not to cover startup news (well, I’m not a journalist, doing my blog alongside my entrepreneurial activities…), I had this first AHA moment 6 weeks into startupolic existence. I was participating to Swiss Startup Camp in Basel and attended a session from DeinDeal founder Adrian Locher. He explained their project of opening a new kind of incubator, directly hosted and sponsored by DeinDeal. As they were no other startup bloggers around (we are still, 5 years after, a very small community in Switzerland), except Jan from Startwerk.ch, I thought « this is my chance to get some easy traffic! ». And I was right, I was the first to tell about the initiative. I got some additional traffic, from people who were not following me at this time. Extending my audience: check. I felt that I just used a cool news to get me some publicity, but could I qualify myself as a blogger? Not really. Or at least not to my definition of a blogger. I realize now that I did not define at this time what kind of blogger I wanted to be. I hadn’t made any real plan, as crazy as it sounds. When you say as an entrepreneur, that it’s not for the destination that you create things, but for the journey… that’s exactly what I have done with startupolic.com. A couple of months later, I wanted to attend a tech conference in Berlin (Next) and thought: why not asking for a media pass? What are the criteria to get accepted? It was the first time I had to « sell » startupolic.com as a « leading startup blog in Switzerland ». It worked out, I got my pass without having to sell too hard. Check. And what an experience! This conference made an amazing job to build a bloggers community, proposed some amazing huge Airbnb flats to have all bloggers in it… I had the chance to learn more about the reality of fellow international bloggers (who were doing it with a strategy, for months, sometimes for years). We had fun and engaged discussions with people like Guilhem Bertholet (a well-known French entrepreneur & blogger), Adelina Peltea (a Romanian blogger, who was writing a book and who ultimately, one year later, introduced me to the management of dance superstar INNA – you just never know what can come out of networking!) and Dimitris Kalogeropoulos (Greek blogger and social media expert), to name a few. I realized that blogging could be more than an experiment and a hobby. I should have a strategy. Or at least, define an editorial guideline. I had it already in mind, but never thought too much about it: provide value to Swiss Startup scene. And try to make the scene shine / be visible outside of the country. And I did (and still do) not want to publish startup news: no need to send me press releases, it won’t get read. Why? I do not have the bandwidth to handle them professionally and do not want to be this kind of blogger. At the same time, startupticker.ch was starting to grow, with support of professional journalists and backing from CTI (Swiss Federal Commission for Technology & Innovation). My positioning ended to be right for me and regarding the rising « competition ». Even though if we are not really competing, if you can be the first to tell about something interesting, you’d like to get the credit for it. But rapidity is the key if you’d like to be in the news business, which is something you need to be fully dedicated to, otherwise it does not work. In 2012, I had a good dose of emotions and realized the power of blogging: nobody is unreachable. If you’re launching a startup, you may (or should) have heard about Brad Feld, one of the founders of TechStars. Entrepreneur and investor. Author of many must-read startup books. I had this simple idea of writing a post on which investors you definitely need to follow and listed Brad. People like when you suggest them great sources of content. But what amazed me was to get a comment notification, from Brad Feld himself ! Not just liking a tweet or so. But doing the effort of coming on my blog and commenting, simply telling: « keep shouting it » (what I keep doing here!). I also met Liam Boogar at WebSummit 2012, an American who wanted to shake the French startup ecosystem with his RudeBaguette blog. I found a lot of similarities between our mindsets, except that he had a real plan and a full dedication to making RudeBaguette THE French tech blog, as well as expand his blog throughout Europe. He told me I could even be his Swiss editor in the future. But as I was starting my startup Coteries (we were doing « mobile fans club for musicians », but we’ve pivoted the company end 2014 into a MVP/prototyping lab) and I couldn’t invest more time being an editor. 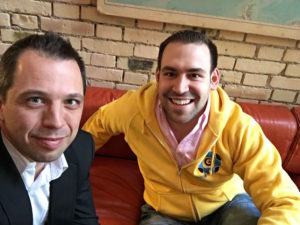 We are now many years after the early days of startupolic.com. I’ve learnt so much. Blogging is kind of part of my DNA, now. What kind of benefits blogging brought me ? Some recognition and personal branding (when people tell « this guy knows something about startups ! »), building a (small) brand from scratch and the fun of experimenting, improving my writing skills in English and finally how to design and write lasting content… to name just a few benefits of blogging ! I’ve learnt so much, both from blogging and from starting my own company, which we have been able to turn into a running business. And where we constantly think about and develop new ideas/products. We have even been able to develop internally a new startup (not spun off so far) without spending time to convince investors (what a huge time saving !) but focusing on customers: Planify. Basically, Planify is a service to get rid of PDF and paper brochures when you’re doing a group travel (or workshop). You share it now on Planify mobile application, which your participants always have on them when taking part to the program. In the past 24 months, I also had the chance of being recruited to launch the first Swiss Fintech Accelerator, Fintech FUSION. It was in parallel of my entrepreneurial journey. What a challenge! I just ended my duty as Program Director (which was not only about the program, but about everything to run and promote an acceleration program!) and am now fully back to my own venture. To grow them. And hopefully, I’ll have again a bit more time to blog on startupolic.com. 2016 was my least productive year of blogging, with only 19 blog posts (but with a best-seller ever: « The Zürich (Swiss) Startup Paradox »). I’ll dedicate more time to blogging this year. 2016 has seen some new blogging and persistent initiatives in Switzerland. Finally. My friend Christian Hirsig, a Berner like me (you’d be suprized how many people from canton of Bern work and launch startups…), has started a serie of video interviews of famous Swiss startup founders, on Swisspreneur . In German, even Swiss German… but with English sub-titles, to make it available universally !). 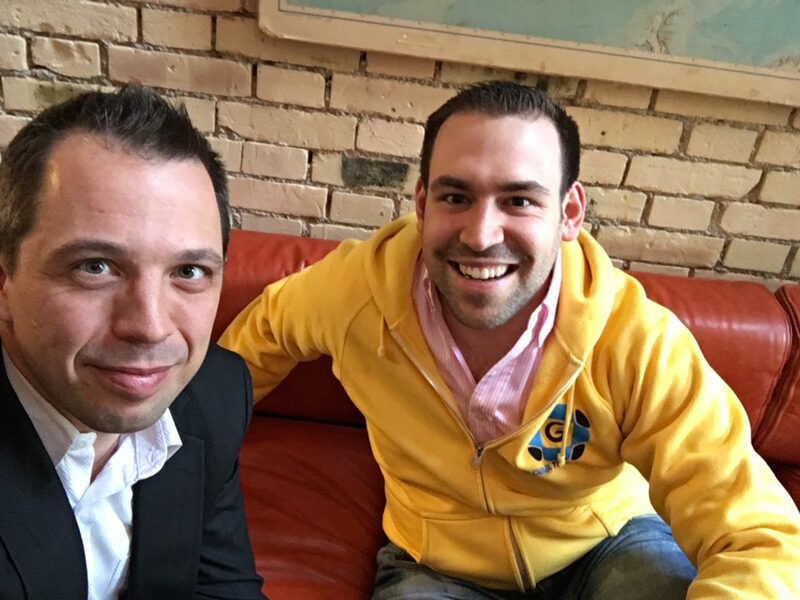 I’ve also met last week Cédric Bollag, from Global Tech Box. Never heard about him before he tagged me on social media, because of a listing (about top startup bloggers in Switzerland – I was not even aware of this ranking). We had a nice conversation and learnt to know each other. As Christian, he’s also interviewing startup founders and publishing videos (which is, BTW, an extremely powerful media). We agreed we are not competitors (and we have different agendas!) and that we should meet again or try to collaborate. You may discover some of his video interviews from time to time on startupolic.com! That’s about 9 years that I am part of the Swiss Startup ecosystem now and the changes have been massive. In the past 5 years, Switzerland has seen a strong development of the scene and many – also private ones – initiatives have been launched. Startup Weekends and Hackathons are now widely known and take place everywhere across Switzerland. Startups are more and more an option for young graduates, because people realize they can do an impact and make sense of their life, without waiting years and years to get a promotion in the corporate world. Startups got hype. Not always a good thing, as the word is over-used and most of the time not appropriate (selling stuff online does not make you a startup founder). But there are ways more people trying to start a business than 5 years ago. What does it mean for the scene? There are more and more people with the right mindset to hire! For growing startups or for corporates (even if they are still more reluctant to hire failed entrepreneurs, they are realizing that they should go deeper into digitization). Or serial entrepreneurs like Ralph Rimet, who get hired as intrapreneur / head of innovation lab in traditional companies. Co-working spaces have become common and widely spread across the country, which were far from the norm just 5 years ago. Switzerland now counts awesome places like ImpactHUB Sihlquai (for instance), where you can really feel the pulse of the Swiss entrepreneurial spirit (5 years ago, you had to go to Technopark and the likes, but without the energizing cool atmosphere you find in co-working hubs). Switzerland was late in launching accelerators, but has welcomed 4 different new initiatives in the past 18 months (Fintech FUSION, Mass Challenge Switzerland, Kickstart Accelerator and HEC Lausanne Accelerator). VC funds in the digital industry are now also available (with Polytech Ecosystem Ventures with new fund of about CHF 40M, existing CHF 100M fund from Redalpine Venture Partners, serial entrepreneur Jean-Pierre Rosat launching 4FOVentures). It is not easier to get funded, but at least some new money is flowing into the scene. Compared to the quantity of money available in Switzerland, it’s still peanuts. But initiatives like the Swiss Venture Fund has been launched and prominent guys of the scene like Jean-Pierre Vuilleumier and Christian Wenger are pushing hard to close it in the coming 18 months. What is also impressive with Switzerland is the capacity of the country to welcome a lot of new immigrants and the resilience of the economy to the surrounding crisis (not saying that some industries are not heavily hurt). It’s comforting for people living here, but in the same time, it still has a perverse effect on the « hunger to succeed ». In my humble opinion, Switzerland’s startup ecosystem has made a massive progress, but still needs to improve to compete with leading startup hubs (with more money flowing in and with startups growing here). We cannot be Silicon Valley (it’s unique) or even London. But I strongly believe there is a Swiss way of doing innovation and scaling companies from here. For this to happen, we still need a wide understanding that our top position is not there for ever, and that Switzerland needs yet to invest massively in digitization. We start (!) to hear it from top politicians since last Summer… finally. The post 5 Years of Blogging appeared first on Startupolic.